Darren Naish: Tetrapod Zoology: Lots of sauropods, or just a few sauropods, or lots of sauropods? Lots of sauropods, or just a few sauropods, or lots of sauropods? I have a window of about 30 minutes before I need to get back to the British dinosaurs manuscript (which really needs to be finished by next week), so let’s see if I can get this done. As discussed in the previous blog entry, early last week Mike Taylor (see accompanying hilarious photo) and I spent the better part of a day working on Wealden sauropods in the Natural History Museum collections. The main point of this excursion was to have our final look (‘final’ as in last look before we submit our paper) at a specimen that we’ve been working on: a highly unusual, in fact deeply weird, new taxon collected in the late 1800s from the Ashdown Beds Formation (Valanginian) near Hastings. I won’t be saying more about it until it’s published, but its ‘discovery’ has prompted me to revisit the problematic area of Wealden sauropod diversity. Well, ok, I’m ‘revisiting’ that area anyway right now, what with the British dinosaurs manuscript, but still. Was sauropod diversity in the Early Cretaceous of England high, or low? First things first: it’s misleading to think of the ‘Wealden’ as a short chunk of time, as this term actually applies to three formal stratigraphic groups (the Berriasian-Barremian Hastings Beds and Weald Clay Group of the mainland, and the Hauterivian-Aptian Wealden Group of the Isle of Wight). ‘Berriasian to Aptian’ is something like 30 million years, so that’s a lot of time for a whole lot of species to come and go. Whole assemblages of species in fact. Certainly the animals known from the Hastings Beds Group are not the same as those of the Barremian Wessex Formation (the best known dinosaur-bearing unit in the Wealden Group). The Hastings Beds Group has yielded Pelorosaurus conybeari (which is actually the same thing as Cetiosaurus brevis, but we won’t go there right now) and P. becklesii (which clearly isn’t congeneric with P. conybeari). P. conybeari, based on caudal vertebrae, chevrons and a large and gracile humerus, is a basal titanosauriform, perhaps a brachiosaurid. P. becklesii, named for tremendously short and robust forelimb elements and skin, is clearly a titanosaur. This is significant as it’s among the oldest of verified body fossil representing this clade. However, there are trackways that appear to have been produced by titanosaurs from the Bathonian of Ardley, Oxfordshire (Day et al. 2002, 2004), so titanosaurs had been around since the Middle Jurassic at least. That’s not all – the Hastings Beds Group has also yielded a single metacarpal which has been identified as belonging to a diplodocid: that’s right, not just a diplodocoid, but a diplodocid. Angela Milner initially made this identification, and more recently I’ve had it verified by Matt Bonnan (pers. comm. 2006). Then we have the new taxon that Mike and I are looking it. It doesn’t seem that any of these animals can be conspecific, so, we have: a basal titanosauriform (and possible brachiosaurid), a good titanosaur, a diplodocid, and a new taxon that isn’t any of these. What about the Wessex Formation, where 30-odd Barremian dinosaur species are known? Naish & Martill (2001) and Naish (2005) thought that sauropod diversity here was quite high, with a possible camarasaurid (Chondrosteosaurus), a few brachiosaurids, a titanosaur (Iuticosaurus valdensis), and an unnamed diplodocoid (represented by a chevron as well as isolated teeth and other elements). This now seems erroneous, or perhaps over-optimistic. The characters supposedly indicating camarasaurid status for Chondrosteosaurus are rubbish, and it’s more likely a basal titanosauriform (and it’s non-diagnostic anyway). The supposed diplodocoid bits are controversial, and the ‘sled-like’ morphology initially used to support a diplodocoid identity for the famous chevron (Charig 1980) is now thought to have been primitive for neosauropods, rather than derived for diplodocoids (see Upchurch 1998). It’s also difficult to be sure that there’s more than one brachiosaurid. The evidence for titanosaurs (procoelous caudal vertebrae, with a distinctively located neural arch) is reasonable, but the remains aren’t diagnostic. Accordingly, when Paul Upchurch spoke about Wessex Formation sauropod diversity at the British dinosaurs Palaeontological Association Review Seminar in November 2003 (co-hosted by Dinosaur Isle Museum and the University of Portsmouth) he cautioned that diversity might have been over-estimated, and that titanosauriforms accounted for what diversity there was. But while some groups – like camarasaurids – have now been removed from the list of taxa, new ones have been added (as it happens, camarasaurids were apparently present elsewhere in Lower Cretaceous Europe, but more about that another time). Firstly, there are definitely brachiosaurids present in the Wessex Formation: the big MIWG 7306 cervical vertebra that I and colleagues described in 2004 (Naish et al. 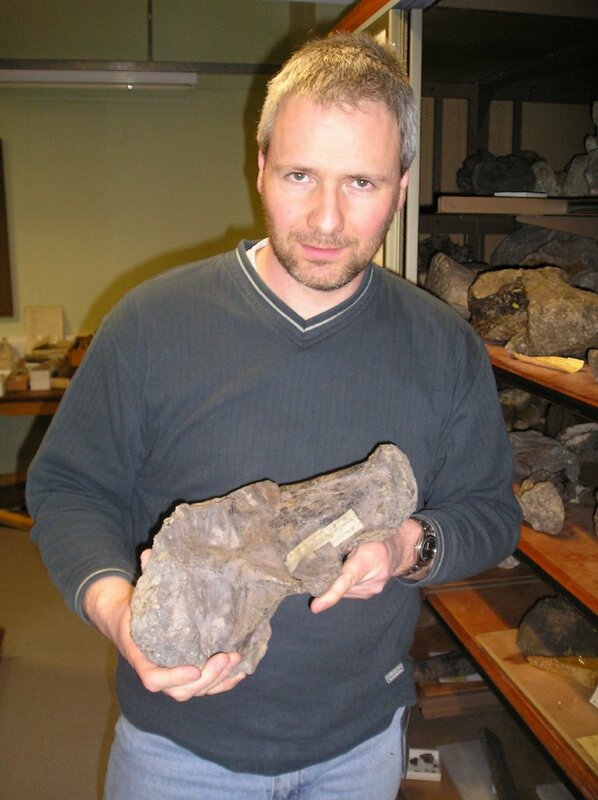 2004) is clearly more like the vertebrae of Brachiosaurus and Sauroposeidon than anything else (go here for more), and some of the dorsal vertebrae referred by Blows (1995) to his problematic taxon Eucamerotus foxi are also clearly brachiosaurid in the strict sense. Then there are the clearly titanosaurian caudal vertebrae, such as those described by Le Loeuff (1993). But there’s more. A big and highly distinctive, pristine tooth forms the holotype of Oplosaurus armatus. 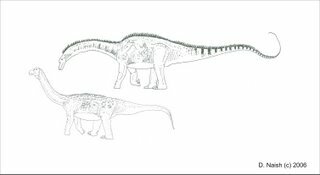 Naish & Martill (2001), the idiots, thought that this might be another brachiosaurid, but that’s clearly wrong: Canudo et al. 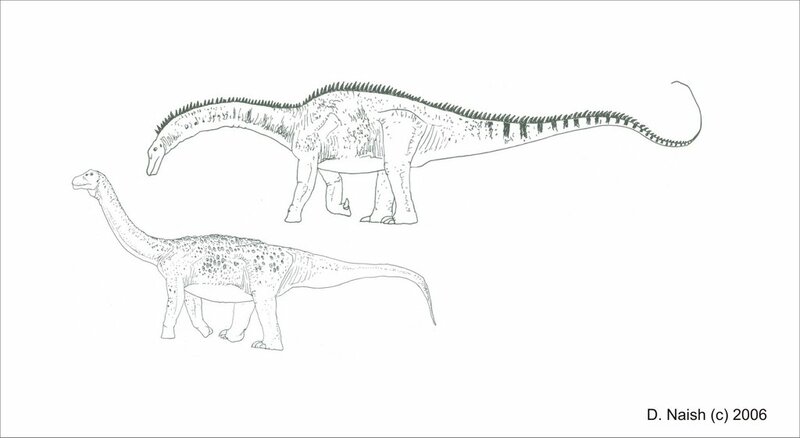 (2002) suggested that Oplosaurus might instead have been closer to Camarasaurus, and Upchurch et al. (2004) regarded it as a distinct neosauropod of uncertain affinities. 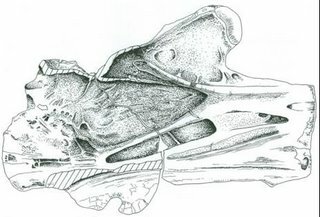 Then there are the brachiosaurid teeth named Pleurocoelus valdensis: most authors have regarded these as non-diagnostic bits of brachiosaurid, but Ruiz-Omeñaca & Canudo (2005) have argued that they’re diagnostic and really represent a good species. Whatever they are, they’re clearly something else from Oplosaurus. And then, finally, there are the diplodocoid teeth figured by Naish & Martill (2001) and identified by Wilson & Sereno as…. rebbachisaurid teeth! I can’t provide the citation for the latter as I don’t yet have the paper, but the recognition of these teeth as rebbachisaurid verifies the presence of diplodocoids in the Wessex Formation. Ok, so they aren’t diplodocid-like forms as Charig and others thought when they were looking at the chevron, but they’re diplodocoids nonetheless. In some senses this discovery isn’t a surprise as rebbachisaurids have lately been reported from Barremian-Aptian Spain (Fernández-Baldor et al. 2001, Pereda Suberbiola et al. 2003), but it now means that the oldest rebbachisaurids in the world are from England. Huh, so much for this being an exclusively Gondwanan clade. So, in the Wessex Formation we have… an unusual neosauropod of uncertain affinities (Oplosaurus), definite brachiosaurids, definite titanosaurs, and a rebbachisaurid. That’s not bad in terms of diversity (adjacent picture shows diplodocoid and titanosaur). To remind you, in the older Hastings Beds Group we have a basal titanosauriform (and possible brachiosaurid), a titanosaur, a diplodocid, and a new and unusual taxon that isn’t any of these. So, also, not bad in terms of diversity, and in fact not that different from the Wessex Formation roster, which implies stability from the point of view of long-term diversity. And, it’s on that point that I must get back to work. I was going to talk about the theropods, but that can wait. Blows, W. T. 1995. The Early Cretaceous sauropod dinosaurs Ornithopsis and Eucamerotus from the Isle of Wight, England. Palaeontology 38,187-197. Canudo, J. I., Ruiz-Omeñaca, J. I., Barco, J. L. & Royo Torres, R. 2002. ¿Saurópodos asiáticos en el Barremiense inferior (Cretácico Inferior) de España? Ameghiniana 39, 443-452. Charig, A. J. 1980. A diplodocid sauropod from the Lower Cretaceous of England. In Jacobs, L. L. (ed.) Aspects of Vertebrate History, Essays in honour of E. H. Colbert. Museum of Northern Arizona Press, pp. 231-244. Day, J. J., Norman, D. B., Gale, A. S., Upchurch, P. & Powell, H. P. 2004. A Middle Jurassic dinosaur trackway site from Oxfordshire, UK. Palaeontology 47, 319-348. - ., Upchurch, P., Norman, D. B., Gale, A. S. & Powell, H. P. 2002. Sauropod trackways, evolution, and behavior. Science 296, 1659. Fernández-Baldor, T., Pereda Suberiola, X., Huerta Hutado, P., Izquierdo, L. A., Montero, D. & Pérez, G. 2001. Descripción preliminar de un dinosaurio rebaquisáurido (Sauropoda Diplodocoidea) del Cretácico Inferior de Burgos (España). II Jornadas de Paleontología de Dinosaurios y su Entorno. Salasa de los Infantes (Burgos, España), 203-211. Le Loeuff, J. 1993. European titanosaurs. Revue de Paléobiologie 7, 105-117. Naish, D. 2005. The sauropod dinosaurs of the Wealden succession (Lower Cretaceous) of southern England. The Quarterly Journal of the Dinosaur Society 4 (3), 8-11. Pereda Suberbiola, X., Torcida, F., Izquierdo, L. A., Huerta, P., Montero, D. & Perez, G. 2003. First rebbachisaurid dinosaur (Sauropoda, Diplodocoidea) from the early Cretaceous of Spain : palaeobiogeographical implications. Bulletin de la Societe Geologique de France 174, 471-479. Ruiz-Omeñaca, J. I. & Canudo, J. I. 2005. “Pleurocoelus” valdensis Lydekker, 1889 (Saurischia, Sauropoda) en el Cretácico Inferior (Barremiense) de la Península Ibérica. Geogaceta 38, 43-46. Upchurch, P. 1998. The phylogenetic relationships of sauropod dinosaurs. Zoological Journal of the Linnean Society 124, 43-103. I await more studies that will clear up the taxonomic mess of Early Cretaceiys British sauropods. Nice summary. Now it's nice to know that there was more to the Wealden than just 'Pelorosaurus'.